Tired of monochromatic, ordinary and same looking table linens? Yeah, me too! So I decided to purchase new dining table runner to spruce up my dining room. Stirring up your room interiors can be an easy task and it can create a seasonal display to grace your dining room. 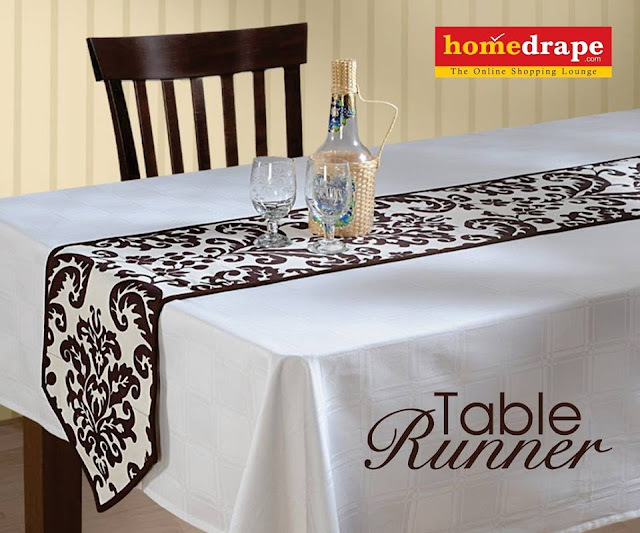 If you want to convert your table into something magnificent, these runners can be your best bet. They are available in different sizes, colors, materials and shapes along with different fabrics. Therefore you can create various combinations and placements by using them in different ways. 1) These runners are versatile and can be used in many ways. People generally use them on table; however adding a bit of creativity can turn the tables around. They can also work with various shapes like square, rectangle, square and oval. 2) Placing a runner lengthwise in the middle is one of the most common ways. You can find it almost everywhere. This placement style gives a perfect path to complement the centerpieces. You can place some candles in the centre. 3) If you have a short or square table which is narrow, you can place a runner across the set up. 4) If you can`t get over with that vintage tablecloth that your granny had gifted you on your wedding anniversary, well then we have a solution for that too. You can buy a runner either in matching shade or contrasting color and place it over it. This will give your dinner table a cohesive as well as decorative appeal. 5) You can pick runners in different fabrics. You can select a runner according to the event. For regular use cotton fabric is the best while for the formal one, you can choose satin or silk runners. Whatever you choose, these runners can surely make your dinner time amazing with their attractive prints and patterns, of course fused with your very unique creative instincts. As the spring beckons, so does the festival of colors, HOLI. It is that time of the year, when the whole nation is smeared with the color of unity, togetherness, happiness and cheerfulness. Zest and enthralling life is the core essence of this Indian Festival. This festival does not only bring the colors and new breeze of life but also lot of guests and friends to exchange the greetings and warm wishes. Thus it is very essential to set the right mood for this auspicious festival of India that brings all your friends and relatives even closer. As Holi is usually celebrated, outdoors, your interiors should be well decorated too. The guests who will come to exchange wished will surely would like to spend some time indoors as well. Thus your living room, patios placed outside and terraces are vital spaces for embellishments. To keep your interiors in sync with the spirit and vivaciousness of the Holi celebrations, assimilate colorful home furnishing products into your interiors. Light up your windows by replacing your tad draperies with curtains in fresh and warm tones. Pick a curtain in vibrant shade that matches not only with your existing home décor but also with the spirit of the festival. Let your windows embrace the freshness to give your ambience a punch of style. Enliven your worn out couch by simply placing few throw pillows and cushion in different sizes and shapes. Adding cushions and pillows on a couch will not only give your drab sofa an instant glam-up but also will also make an interesting statement in your interiors. Switch your beige and white cushion covers with colorful and dazzling coverlets in yellow, red or green to elevate the surroundings. The festival of Holi is incomplete without food. And when it comes to serving guests, you must play a perfect host. Unfurl beautiful tablecloths that will complement the entire vibe of the festival. Decorating the house during festival like Holi is a essential. But doing it in a stress-free way is a must. With ongoing amazing deals and offers at Homedrape, it is even possible! 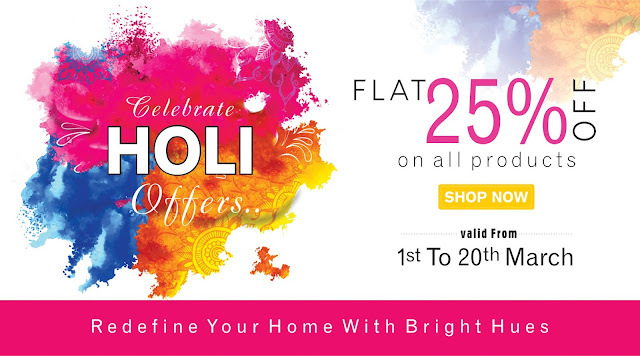 Now you can grab your favorite merchandize as Homedrape is offering Flat 25% off on all the categories of the products. All you need is a laptop as your favorite products are waiting to get explored.